youth | In the Key of "H"
As I do from time to time, I browsed the “New Releases” and “Recently added” sections on the Netflix site last Friday. This is always a very sad time, and I don’t know why I continue to subject myself-and my wife-to such sorrowful futility. Like going again to check what’s in the fridge, even when you know there are no more snacks left-but you just check for the sake of checking, I go through these hopeless motions every so often. Always with same results. After realizing nothing offered any promise, I decided to check on other sections. For some reason I browsed the “Documentary” section and saw Beware of Christians. I had seen it before and thought the title was captivating enough. So I gave it a shot, and I’m glad I did. 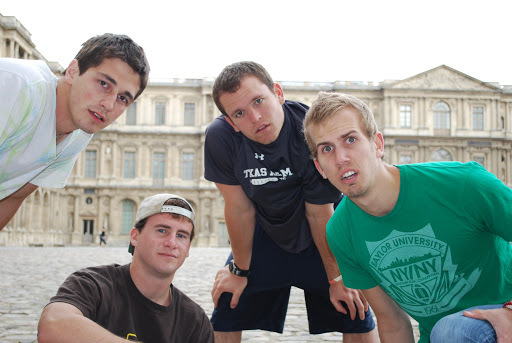 The documentary comprises 4 college students really investigating what Christianity is all about. They know what their pastors and parents have told them about the bible, but they want to remove themselves from their current setting to see what really lines up. Armed with some bibles, video, and enough to clothes to get them through a month or so, these young twenty year old’s take an honest look at their own hearts. They stroll through a number of different countries focusing on a different issue in each place. Materialism, sexuality, persecution, alcohol, all get their fare share of air time. At each locale, the group picks a theme scripture verse or two regarding what the bible really teaches against the backdrop of each local post-Christian culture. But they find themselves more encouraged than discouraged. They see Christian foreign exchange students, and hear a European witnessing about Jesus to ballerinas. They come across people apathetic to the gospel and hypocritical Christians, yet come across one who articulates justification by faith alone. They interview the equivalent of an American idol finalist who is voted off the show fans learn he is a virgin. They are college students, so they are goofy. They literally slap each other and steal post cards meant to be sent to a girlfriend. But they are open, honest, and non-judgmental. Much is there to commend this documentary, but I will highlight two things. Normally a quest to find out what Jesus is “really like” and what he “really says,” foolishly takes place in isolation from community and in separation from a local church. While these kids sought to get away from the normal religious expression of American Christianity for a season, they do emphasize being a part of A local church. They actually condemn church hopping! How refreshing. Churches need young folks to be part of a church body. They think differently, and that’s often good, even if it makes “aging” folks (I’m balding and graying, so I feel qualified to say “aging”) uncomfortable. They bring energy, enthusiasm, and honesty. The younger generations are far more open and whereas our older generations are much more guarded. Younger folks often ask the question: should we really be doing church this way? Sometimes the answer is yes and sometimes no. But I found myself, a 35 year old pastor, being very challenged by these twenty somethings. I know that they don’t have jobs yet, and wives or kids. But these kids called me to pursue Jesus more passionately than I am now. College prophets. Make sure you put yourself in the path of both young and aging Christians. They former might make you feel uncomfortable, but then again, that’s what prophets do. Be glad for them. This is simply a follow up from yesterday’s Modgnik post highlighting some random things I learned as a leader last weekend. 1.) Retreats really do have a cost. Obviously they cost money, as the retreat center needs to be rented (600 kids! ), speaker paid, band secured, creative skits practiced, food eaten, kids housed, gas guzzled, etc…..These retreats take up a big chunk of our youth budget, and family wallets/bank accounts do take hits. But there is also physical toll that retreats take on leaders. One of ours progressively got sicker throughout the weekend and will be paying for her sacrifice this week. Sleep has never been my companion on these retreats either. But also, consider the family sacrifice. My four year old was not happy to send has Daddy off, and so that made his Mommy’s sacrifice a bit harder as well. But it is part of my job, so how thankful am I to have parents and another non-parents come to labor alongside of me? Very thankful. I became acutely aware of some of the costs that really go into such a retreat (saying nothing of the sacrifice of those who regularly get together to plan these things). Modgnik is worth the price of admission and the “pay-offs” in the lives of these youth-and their leaders-is often eternal. Cost counting doesn’t make me prideful but thankful for those who sacrificed to send kids and leaders. 2.) Youth will give you a pass when you don’t pass the cultural relevance test. Our speaker referenced R.J.3, the former Heisman trophy winner and current Washington Redskins quarterback the first evening. 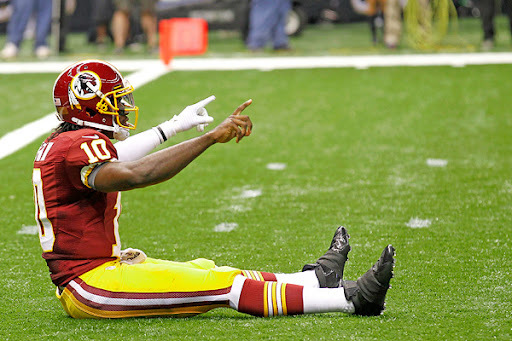 The problem is that his name is Robert Griffin III, and so his nickname is R.G 3. He got some flack, but the kids cut him some slack. No mention of it throughout the weekend. Perhaps the Harry Potter allusions covered his bases, but I think that most kids get over that kind of stuff pretty quickly. Middle schoolers care that you like them much more than how well you know their culture. Fortunately. I must be living in the past, because I knew ZERO pop songs they played as we piled into the meeting room and cafeteria. Coolness and relevance are far less important to youth than love. 3.) Middle Schoolers can listen to sermons. This speaker is an RUF guy, and RUF guys do sermons. They preach expository sermons, and regularly allude to verses and say things like, “I get this from verse 8.” He didn’t disappoint, and yet I was concerned that he might be over the kids’ heads. Last year’s speaker looked and sounded very different, and spoke on very different subjects. This guy preached Revelation, yet he wasn’t over their heads at all! Most of them articulated back to me exactly what he said in our cabin discussion time. The amount of “take-away” from the sermons confirmed that kids really can listen. A number of girls even took notes. While I do think preachers like myself need to recognize folks with shorter attention spans (like myself), middle schoolers should be expected to follow along. As parents we can follow up with our kids and expect to have meaningful sermon discussion. But we have to raise our expectations beyond the “Well I didn’t hear him/her talking too much this week, so things are good” perspective. 4.) Illustrations are important for all, but especially so for middle schoolers. I consider illustrations as the “coat hanger” on which to hang both the truth and applications. When connected with the truth and application, they provide something to help the kid think about when the sermon is done. These kids could re-tell the illustration and the truth articulated. Reinforced the need for illustrations, and their power to connect the listener to more than just the preacher, but to Jesus. Just some things I learned this week and want to pass on. This past weekend, Redeemer’s youth group, and 4 leaders made our trek down to Rockbridge (a young life retreat center) for the annual Modgnik Retreat 2012. Modgnik is “Kingdom” spelled backwards, which is appropriately named because Jesus’ Kingdom often runs completely backward to how the world (not to mention Christians) operates. Last year, the speaker focused on the Kingdom and Culture. This year, Shawn Slate, R.U.F. (Reformed University Fellowship) campus minister at University of Virginia, camped out in Revelation. He called the youth, and of course their leaders, to a greater heavenly vision with all sorts of relevance for our lives today. While the speaker is clearly in his element on the college campus, his personality, allusions, honesty, and illustrations reinforced a very deep message. As far as I could tell in the following cabin discussion times, the youth tracked well and could rehash the main points and illustrations. So with that in mind, let me rehash some for you. On the first evening, he challenged us to think about Revelation like a portrait. As with anyone creating a portrait, the artist is asking you to see the world the way he sees it. So it is with God, who offers us a portrait of what is really going on with the world. And we need such a portrait because we don’t see the world from His vantage point. Yet the portrait of Revelation offers us a beautiful glimpse of not just what God is doing in the world, but a deeper, brighter, more beautiful picture of Jesus. The one who is first and last, and everything in between. The world hinges around Him. The portrait is ultimately a portrait of Jesus. He also gave us something to really think about in regard to how we read Revelation. Some of the bible explains, “Do this, or believe this,” but Revelation is God’s “show and tell.” Instead of believe this, do this, understand this, we have a “see this.” A helpful hermeneutic indeed for connecting 1st century images to 21st century life. The picture of Jesus we have in gospels is of gentle, suffering, servant-King, but we see a bigger, brighter portrait in Revelation. Nothing boring or ordinary, but a King worthy of respect, as John immediately falls down in His presence as if dead. Jesus isn’t our “binky.” But how cool is Jesus’ offering the comfort of a “Fear not?” We’re undone in His presence, but he puts us back together in His presence. Fearsome and powerful, but compassionate and reassuring. Jesus makes no promise of comfort or power, but he does promise none other will satisfy. Why do we need such a portrait? Because Jesus is inviting us into this story of what He’s doing in the world. It’s an invitation, more than a straight command. If God captures our imaginations, He captures our hearts. That’s what He really wants. Our hearts. One of the more challenging images he presented was that of Jesus saying, “I will spit you out of my mouth.” Instead of us looking at Jesus and saying, albeit inaccurately but honestly, “I’m bored with you,” Jesus is ultimately saying, “I’m the One who is bored with you!” Powerful and sobering. When John lays his eyes upon the figure of the Son of Man, where is he? Right smack dab in the middle of His people. Jesus is always right there with His people. He suffered for and with His people. And even now, while reigning, He is still in some real sense here with his people. Comforting. So how do we live now? We long for the return of this King. We can see his presence now, though its distorted, like the Mac Photobooth where folks twist, turn, and stretch photo images. If you look closely, you can still see glimpses of what the world should look like. It’s there. But we long for the real fulfillment. We bite into 3 foot chocolate Easter bunny, and discover its hollow. But one day we get a solid chocolate Easter bunny. We are heading for a real, solid world one day. Not an ethereal realm of spirits, but a real tangible world made new. Can’t wait. Exciting! Our cabin time after this talk focused on the hope of what will one day be. Our imaginations need to be recaptured, particularly in regards to relationships. Consider judgment on the evils of this world. We don’t have to exact vengeance, but can trust God to do that. This belief makes us more gentle, less retributive. Consider the fact that your Christian friend, leader, etc…, who hurt you, will be made new as well. If we can imagine what that person WILL become, with their positives accentuated and negatives redeemed, we can love/forgive/bear with them better TODAY. Rubber meets the road kind of stuff. Finally, he closed with the reality that the Return of the King will be good news for believers, but bad news for unbelievers. He illustrated what longing looks like. His little daughter called her daddy a bunch of times while on his way home. Daddy are you coming now? Yes, but I had to get groceries. Daddy are you coming home now? Yes but I had to pick up your brother. Daddy, are you coming home now? Yes, sweetie, do you see that blue car, I’m just behind that blue car? His daughter was in the front yard ready and waiting with a soccer ball to play with her daddy. That’s anticipation. That image will stick. Hope you feel somewhat as if you were there. Would have loved to have this kind of stuff when I was a youth! 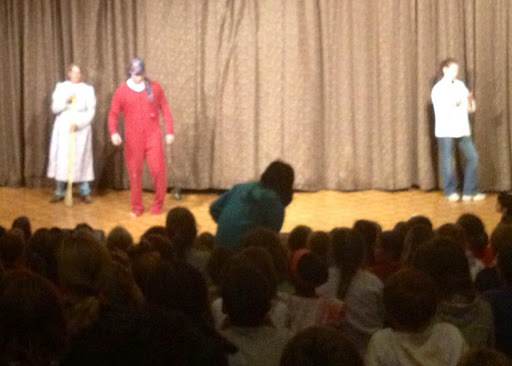 Just for your info, that is me in the pic, wearing a giant over-sized onesie pajamas. My skit career made a brief comeback after years of dormancy when someone volunteered me simply because I’m loud. Compliment or fact? In our Middle School youth group at Redeemer, we spent 4 weeks on the topic of heaven (Revelation 21:1-8; 22-27) and its current application for our lives NOW. It seems strange, almost counter-intuitive, that thinking about something so seemingly “other-worldly” would have any sort of real impact in our lives today. But nothing could be further from the truth. For starters, the concept of the final state of heaven (heaven as it exists now is only a “third base”) as the New Heaven and Earth in Revelation 21 is anything but “other worldly.” God comes down to Earth and dwells with His people DOWN here. It is described as city, where there is non-stop action going on. The gates never close their doors; we called it “the city that never sleeps.” Kind of like a Las Vegas without much of what goes on in Vegas. It won’t be boring. The best of all cultures will be present and the worst of them will not. After opening with the lie from John Lenin’s “Imagine”-that if people imagined there were no heaven then they would live for today-we moved into some brief review questions. Then I decided to let the kids, as we’ve done several times before, create a skit to demonstrate to each other (we always break into two groups for these) what heaven is like and what difference it makes in life. This helps reach those with differing learning styles, as well as challenges the kids to really chew on how to communicate and apply deep truth. My group, led by a Sr High and myself, came up with the idea of a group of guys wasting their lives away in a bar talking and dreaming about the next thing to cross off on their bucket lists. These Middle Schooler’s, on their own (as far as I can remember) came up with this idea. 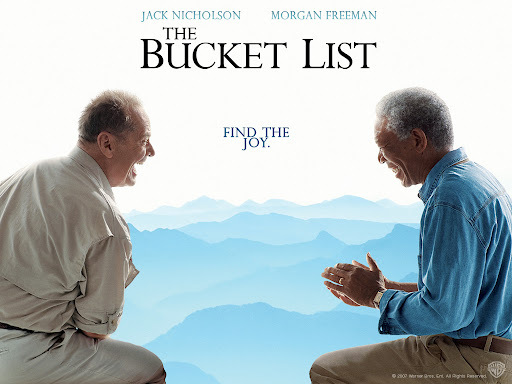 They recognized that there is no need for a bucket list for Christians. If heaven will one day come down to Earth, there will be plenty of time for those things you don’t have time, money, opportunity, or quite frankly God’s approval, to do now. So begin to believe in the final promise of the gospel-freedom from the presence of sin-and live more radically and freely than you would have if you were unaware of the last chapter in God’s Story of Redemption. There’s more joy here than crossing of another one off your bucket list. As I mentioned earlier, this past week was Redeemer’s Missions Week. We do these things yearly to really emphasize world missions. Without something yearly to remind us to really hone in our thinking, praying, giving, going, we can easily forget about people that we’ll never see (but hope to one day in heaven). So for our last act of the Missions Week, one of my incredibly helpful youth teachers requested we show the recent David Platt Sermon delivered at Together for the Gospel (T4G) for youth group. More often than not, I try to give folks the freedom to bring options, run them by me, and then let them run with those ideas. So we watched what has been deemed as the best sermon ever preached on missions over a delectable spaghetti dinner. 1.) I was wrong. I thought it would be best to break up the video into 2 sessions. An hour long sermon can be difficult for a middle schooler. Last year they listened to a half hour audio of a Piper lecture and it did not go well! The Sr High’s did go well on the other hand. Plus, if we broke it up, I figured we’d have more time for discussion. However, I yielded to the desires of the one who wanted to show the video and am glad I did. Leadership sometimes involves yielding. It also involves admitting you were wrong! I even told the kids I didn’t think they had it in them, but that someone else did! 2.) Teaching up. I always tend to “teach up.” Our Jr High use Sr High material for Sunday School and it has gone well. Our Sr High use an adult study from Tim Keller and have been doing this type of stuff for a while. When we had to break up our Sunday School classes from the normal break-up (PreK-K, 1st-2nd, 3rd-4th, etc…), we sent the 2nd graders up and the Pre-K have been working with the 1st-2nd grade material. I prefer to teach up. I knew that the Sr High’s would be OK with the video, but my concern was the middle school kids, particularly the younger middle school kids. But in the end, “teaching up,” was the right way to go. 3.) In “teaching up” one must still remember the younger ones instead of assuming everyone “gets it.” This sermon is probably the best sermon on missions I’ve seen, but we need to remember that it was delivered to pastors at a pastor’s conference (of course many others go who aren’t pastors, but those who go have more knowledge than most others in the church). 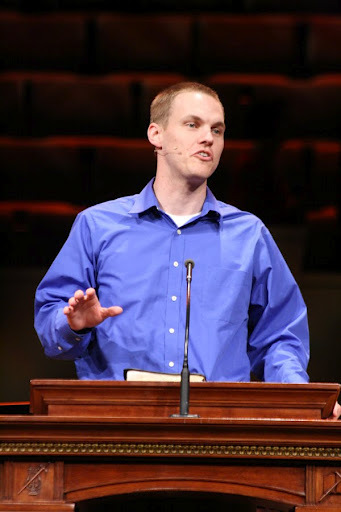 As a result, David Platt does not define all of his terms (and he shouldn’t have to). It is impossible to think like a middle schooler if you are not one. But instead of assuming that all kids knew such terms, I made sure to get up and ask the kids if they did. I’m glad I did, because several didn’t know what the word “Sovereignty” meant; and that was a word used in his main point! So I let the Sr High’s define “sovereignty” for the others, as well as “people groups.” Those were two huge points in the sermon, and several folks didn’t know what they meant. When you “teach up,” you still have to take pains and ask questions to make sure kids are getting it. But in the end, you end up letting the older kids assist in teaching the younger kids. So cool to see. 4.) Power of stories. While David Platt didn’t illustrate heavily, he did use several stories and anecdotes that I could tell ALL of the kids got. It is beautiful to see a middle school lad get excited about a story where a pastor realizes that dying is gain; because that pastor realized it, so did his persecutors. They would have been worse off killing him, so they let that joker live! That’s priceless. All the kids got a kick out of that. I think these stories will stick, even if some of the main points or terms may not. After the brief discussion and clarification time, we sent them on their way. It was a great night and encouraging to expose these kids to the radical call of the gospel to lose our lives for Jesus glory. Whether they go overseas or minister here at home, we have to teach our kids to say no to the suburban American comfortable lifestyle and to find the joy in following Jesus wherever we are. If you haven’t seen the video, check it out here or the audio here. When I interviewed for my first youth director position, the interviewing pastor said, “Are you comfortable teaching TULIP?” I was surprised-and frankly turned off-that he would ask me that question so soon in the informal interview. But the funny thing is, now twelve years later, I don’t think I’ve actually ever sat down, or rather stood up, and specifically spent a deliberate time teaching Calvinism that way. I’ve also never preached a sermon designed to prove what I believe to be the truth about predestination. Instead, I’ve just more or less assumed that truth, and so have taught passages of scripture Calvinistically. Let me give you two examples from this Sunday: one from Sunday School and one from youth group. 1.) Sunday School. I was trying to affirm the good things about the book Crazy Love before moving on to the critiques. We looked at the parable of the Seeds and the Sower, which explains that the true believer will produce fruit and persevere by faith until the end. He/she will not be overtaken by the weeds, the rocks, the cares or the persecution of this world. I didn’t say, “this is the Perseverance part of the P in TULIP.” I simply emphasized that true believers will persevere until the end. The passage refutes the “I prayed a prayer when I was 6 and am good to go now” mentality. I had a professor that would say, “That’s not Reform theology, that’s just bible!” I prefer to try and teach Reformed truths this way. 2.) Youth Group. In a previous youth group, we learned how gossip is living contrary to the gospel. As a result, I figured we should probably instruct the kids that their responses and expectations to gossiping friends will depend upon whether their friends are Christians or non-Christians. For instance, while some non-Christians MAY respond favorably (Matt 5:14-16), we should not EXPECT them to respond favorably when confronted. Why? We read Ephesians 2:1-5. Because the natural state of man (and teenagers!) is that we’re dead in sins and trespasses, and enslaved to the “prince of the air,” until we’re made alive by Jesus. Why should we EXPECT them to NOT gossip? In addition, their real problem is not that they are gossiping, but that they need to be forgiven and made alive by Christ. What good is it to just tell them to stop? I just gave them a little of the “T” for Total Depravity (I didn’t go all the way and say dead men/women can’t choose Jesus either, but it was a start). This past Sunday afternoon, Redeemer, went to the Corn Maze at Cooper Farms in beautiful historic Milton, WV. We combined both Sr. High and Jr. High youth groups and allowed families to bring their children. As a result we had over 40 human beings who came together to fellowship and find their way out of the maze. For the 2nd year in a row, my group was last. Whoever said, “Teach the children, and let them lead the way…(I know it was Whitney Houston)” definitely didn’t have the Corn Maze in mind. After we finally made it out, someone snapped this picture, which shows most of the folks involved. Again, because we were so late, some folks had already headed home or to Pizza Hut to save seats. It was one of those days, outside of us getting so lost (although that was what the young girls in our group actually wanted! ), where things just seemed to click. The weather was gorgeous, conditions were “brochure” and we had all portions of our congregation represented. The latter encouraged me just as much as the warm day and cool breeze. It is vital that youth do not ONLY separate and do their thing AWAY from everyone else. While they do need to develop and deepen their faith in community of folks their age-they spend most of their days with people at school their own age-they can’t ONLY spend time with people their age. Age specific youth groups and Sunday School, or Christian Ed (that sounds so much cooler, doesn’t it?) correctly supplement the gospel which is to be fleshed out and talked about at home. But youth need more than regular youth group and parents. They need community. They need to be immersed in a community of brothers and sisters, as well as fathers and mothers in the faith. One of the reasons why MANY youth leave the church when they are older is that they have NO relationships with adults. According to Essential Church by Thom and Sam Rainer, one common denominator with young adults who never left the church was multiple adult relationships. A YoungLife friend of mine echoed the same sentiments. They need godly adults in their lives. The more the merrier. Not just a youth leader or two (those are important-they really are), but a number of adults. I believe youth need to have THEIR time. But if we only give them THEIR time, and take them away from the rest of US who are no longer youth, then we will ultimately be doing them a disservice. Simply isolating them from the rest of the church may help them “beat the streets” for a season. But will they return if there is no connection outside of youth group? I don’t think we need a study to see that. They’ll find new friends who don’t go to church. They’ll find entertainment somewhere else. If they go to church as a college student, and are simply looking for a youth group type experience, they won’t find it. Some college basketball coaches experience a zero% graduation rate. I won’t name names. It’s not that big of a deal for them, as they figure at least it keeps them off the streets. I’m OK with that. But when it comes to the church, our goal in discipleship is someone maturing in Christ (Col 1:28-29). It’s not simply to keep them off drugs for a while. Our goal is bigger because our Savior is bigger and offers bigger things for us. Our goal in youth ministry is that they walk with Jesus NOW, and LATER when they leave the home and connect to a local church. Now and Later. I’m not diminishing the need for peer relationships. I think some folks really do. I don’t. Those relationships are extremely important. But I don’t want to see Redeemer diminish the need for adult-youth relationships. That’s why I appreciated the Corn Maze so much. Maybe next year I’ll go with a different group and not get so lost. But I guess that’s part of why you pay 6 dollars to get in….